Between 1918 and 1940, twenty-two National Parks produced popular window stickers as proof of admission. They were eventually discontinued because vehicle windshields were dangerously covered up by the stickers! 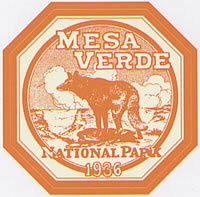 This is a reproduction of the 1936 Mesa Verde National Park window sticker. Made in the USA with fade-resistant UV ink on durable vinyl, suitable for indoor or outdoor use.